Whilst I deliberate both my current trouser fitting issues and the specifics of my own #MMMay17 challenge, I'm going to share with you a cute little project I completed for Dolores a few weeks back. This project came about by acquiring the fabric first and then figuring out what to do with it, rather than finding a pattern I wanted to make and sourcing suitable fabric for it. 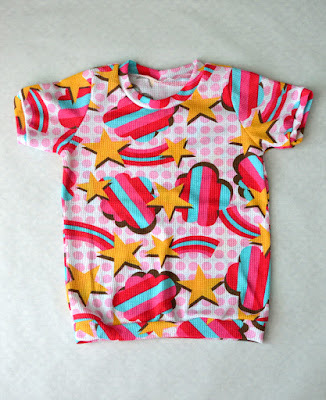 I saw this crazy rainbow-stars-and-spots knit on one of Girl Charlee's new-stock announcements and my internal WANT alarm sounded loud and clear. It looked so fun and cartoony, and I knew Dolores would love it (in no small part due to it being predominantly pink). Mark at Girl Charlee was generous enough to send me 1.2m for free (thanks Mark! ), and when it arrived I found it most intriguing. Firstly, because I rarely pay attention to such things even though it is clearly displayed on their site, I didn't realise that the print was on such a large scale. I love how that makes this fabric even bolder. And secondly, it was much thinner than I anticipated, slightly see-through in fact, so my considerations for another Corfou dress went out the window. This fine, light weight knit fabric with an unusual waffle texture was, in my opinion, therefore destined to be summer pyjamas (although I'd love to hear what else you'd make from it). My decision to make summer pyjamas gave me the perfect opportunity to test out Brindille & Twig's recently released free Ringer tee pattern (as previously mentioned in this post about my favourite free children's sewing patterns). I actually ended up making two of them. Initially I used the size 3-4 (Dolores is three and a half now) but it came out massive, so I tried again using the size 2-3 and removed an extra 5cm of length from the front and back pieces and the fit was much better for this forthcoming summer. What I really like about this pattern (aside from the price! Thanks Melissa, creator of Brindille & Twig, for your generosity), is that the neckline, sleeves and bottom edge are all finished with bands of fabric so you don't need to do any fiddly hemming. Trying to hem a thin, textured fabric like this would have been quite a headache I reckon. The pants pattern was from Ottobre magazine, which I used last year for the monsters-and-snacks pair. That pattern also deploys bands of fabric to finish the edges, removing the need for hemming. Even though the temperature at night hasn't really been warm enough yet, Dolores has insisted on wearing these several times. She would not be persuaded to keep them until summertime; I wish I had that problem with all the things I sew for her (check out the grey bubble shorts on my Instagram feed (@sozoblog) for example)! The only issue with this pyjama set is that I have to go back and insert some elastic around the top of the pyjama pants as this fabric is 100% cotton and therefore doesn't have sufficient stretch and recovery to act as a waistband. Once again, the information was clearly there if I'd looked for it... If I'd seen this fabric last summer, I would have made myself a Cordelia maternity camisole out of it, which would have both cheered me up and cooled me down during the uncomfortable last part of my pregnancy. 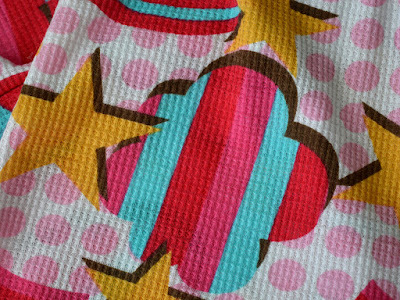 BTW, this rainbow fabric is currently on sale, so if you or your scamps need some summer jammies, or another type of garment I failed to consider for this fabric, you can bag some for just £3.98 a metre. Aw this is just the best pyjama set Zoe!! I love that fabric - the pattern & the waffle texture. If I hadn't just spent money on fabrics for quilts I would definitely be buying some! 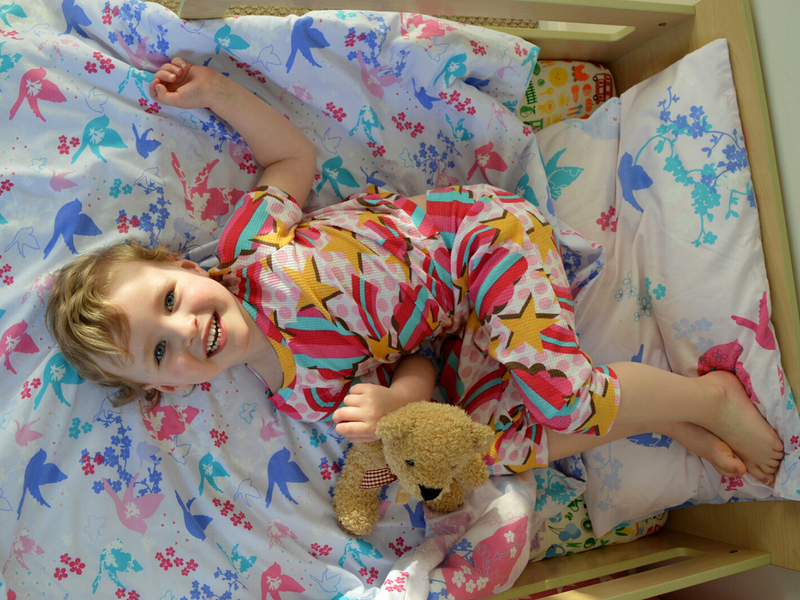 What fabulous fabric, just perfect for pyjamas! Respect to Dolores! 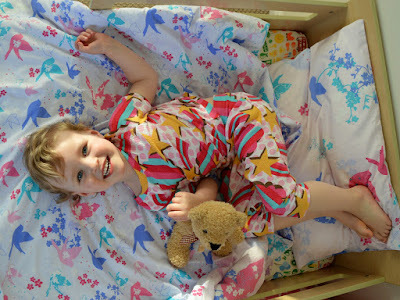 I love that she knows what she likes and she looks so very happy in her new Jim- Jams. Success all round. So precious! And Dolores is smart as well as adorable! I'd wear them too. Hi, great post. Baby clothes are so cute. I like it. Thanks for taking time for sharing. Keep blogging. Great Article and thank u for sharing.